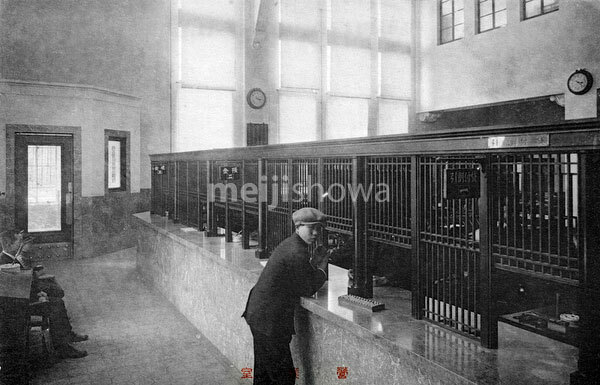 A customer at the teller window of the head office of KK 133 Ginkou (133 Bank Ltd.) in Ginzachou, Hikone, Shiga Prefecture. The Japanese government authorized the establishment of national banks in 1872. KK 133 Ginkou was founded in 1879 (Meiji 12) when it was split off from Dai 64 Kokuritsu Ginkou (Number 64 National Bank). It was based in Ginzachou, Hikone, Shiga Prefecture.